By all accounts, George Washington did not chop down his father’s favorite cherry tree. And if there’s any amount of truth to this popular American folktale—first printed in Parson Weems’ The Life Of Washington—the future first president of the United States certainly didn’t admit to the act with an infinitely quotable apology like, “I cannot tell a lie, I did it with my little hatchet.” And yet, despite its apocryphal nature, the story retains a tremendous power that extends beyond the simple act of myth-making. The main character and his future deeds (the heroic ones as well as the objectionable ones) matter not; the story of Washington and the cherry tree endures as a parable of honesty and contrition. It’s been told and retold so many times that any attempts to prove or disprove it are irrelevant. Like the story of Jebediah Springfield at the center of “Lisa The Iconoclast,” the importance is in the meaning, not the details. It takes the wisdom of Springfield’s wisest resident—and the hardheadedness of her noble buffoon of a father—to get that notion across. In that emotional bedrock, even the most cockamamie plot can solidly take root. “Lisa The Iconoclast” is a funky little pop-culture pastiche, a 1970s paranoia thriller with a Frank Capra ending. (I was all happy with myself for identifying the Capra homage, only to watch the DVD commentary and curse the staff for mentioning the It’s A Wonderful Life director. I wanted to be right without being told I was right, dammit!) Movies like The Parallax View and Three Days Of The Condor get their kicks from exposing the seedy side of Mom, baseball, and apple pie—the advertising campaign for The Parallax View even alluded to the third of those quantities—which is at the heart of Lisa’s personal mission in this episode. All her life, she’s been taught to revere Jebediah Springfield and his cromulent sentiment that “A noble spirit embiggens the smallest man,” and the truth of his pirate past adds further doubts to Lisa’s already skeptical worldview. Fittingly, she’s joined in this episode by Donald Sutherland, representing Klute and the 1978 version Invasion Of The Body Snatchers, but working for the other side this time. As Hollis Hurlbut, Sutherland plays the tweedily unassuming villain just right, the rougher edges of voice conveying the amount of menace necessary for Hurlbut’s eventual heel turn. The twist of “Lisa The Iconoclast” is its subversion of a subversion. The ingredients for a feel-good civic-pride story are part and parcel with the paranoid thriller—everybody loves an ironic use of “The Stars And Stripes Forever”—so the episode goes for a conclusion that would sit right with both. Lisa’s discovery about Springfield’s founder is confirmed by the dead man’s silver tongue, but a last second reversal gives way to an ending in which she choses to ignore what she’s learned and join her father in the bicentennial parade. The counterculture celebrates alongside the establishment, which is kind of ingenious—but at first glance, it can make “Lisa The Iconoclast” look tidier than it is. Lisa is allowed to sell out her ideals just so she can blend in with the crowd for once—what is The Simpsons trying to tell us here? Keep in mind that there’s still a sniper overlooking this all-American setting; remember that Homer gets to live out his town-crier dream thanks to a play lifted from the Animal House playbook (another nod toward Sutherland’s filmography). “Lisa The Iconoclast” is a complex episode, and that complexity comes down to the way the show plays with Springfield’s infamous mob mentality. “A noble spirit embiggens the smallest man” isn’t the episode’s only moral; it also teaches us that unthinking collective—the one that would spend unwisely on a flashy monorail or converge on the local brothel with torches and pitchforks—has a heart, too. As the resident know-it-all, it’s an important lesson for Lisa to learn: Just because she finds freedom in the truth doesn’t mean that everyone else will. That nobility informs the relationship between Homer and Lisa—in this episode and beyond. “You’re always right about this type of thing, and for once, I want in on the ground floor,” father tells his daughter, with a sweetness that can’t be undone by his tricorne-hat-and-bathrobe ensemble. 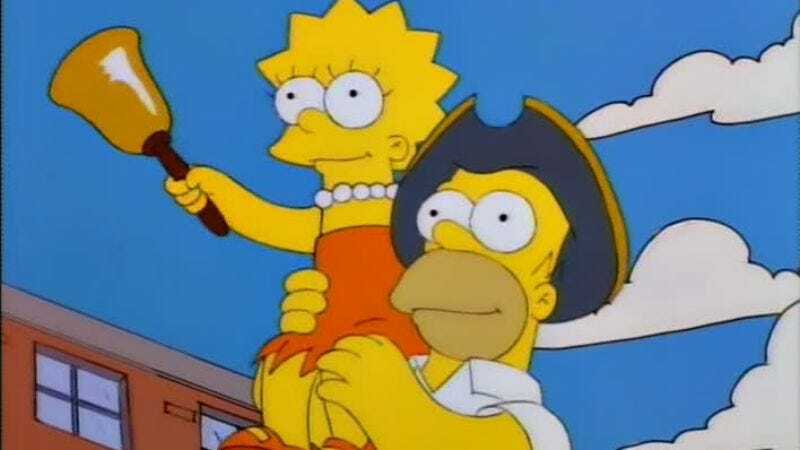 “Lisa The Iconoclast” has such an absurd premise, but every part of it feels so real: There’s an equal amount of passion in Lisa’s pursuit of the truth and Homer’s approach to the town crier role, and that’s accompanied by a believable disappointment when neither gets what they want. 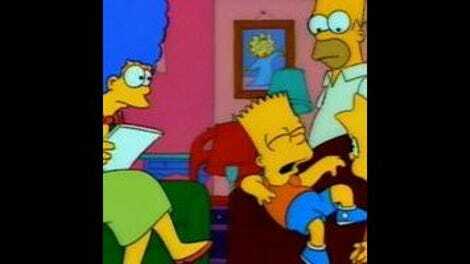 And there’s a very real inner conflict there as well, with Homer taking so much pride (in such a funny way) in the town crier role, but not wanting to value it over Lisa’s happiness. It’s a great episode for the characters as well as the actors who portray them: Springfield’s finest specialist, Yeardley Smith, and its most capable utility player, Dan Castellaneta. Big ensemble pieces like “Lisa The Iconoclast” always bring the best out of the cast-within-the-cast voiced by Castellaneta, and his signature character gets to emphasize the innate sweetness that makes his most dunderheaded actions tolerable. But “Lisa The Iconoclast” belongs to Smith. Unlike her Simpsons cast mates, she only plays one regular role on the show, but that’s freed the actress up to find remarkable depth and nuance in her performance of Lisa. I love the range she brings to the character in “Lisa The Iconoclast”: the righteous indignation, the panic at George Washington choosing Janey to be the United States’ first female president (“She’ll pack the Supreme Court with boys!”), her epiphany at the parade grandstand. The episode’s balancing act applies to Lisa and Homer as well, as it lays out twin stories that have the illusion of high stakes. The pure silliness of the town crier job leavens Homer’s turmoil; if Lisa fails to reveal Jedediah Springfield’s true identity and dastardly nature, it won’t threaten national security. That’s what ultimately makes me square with the ending of “Lisa The Iconoclast”: That torn portion of George Washington’s portrait doesn’t hide the ingredients of Soylent Green or anything. It’s just further myth-making about a man who was pretty mythical to begin with. Because once we’re dead and buried and someone has replaced our bodies with skeletons, we forfeit any control over the stories that are told about us. We can attempt to conduct the narrative from the beyond the grave with journals of our innermost thoughts and confessions to our gravest crimes, but if we’re lucky enough to be remembered, then the people doing the remembering are calling the shots. “Lisa The Iconoclast” captures this sentiment beautifully, showing that the people of Springfield are the ones getting the last laugh over the pirate who tried so hard to dupe them all. They’ve turned him into the figure that unites them all, on both a grand city wide scale and on a smaller scale within the walls of 742 Evergreen Terrace. This takes a bigger chunk out of Sprungfeld’s reign of terror than George Washington’s wooden teeth ever could, and I cannot tell a lie: They did it with their parades and their educational films starring Troy McClure and their ceremonial bells. Lisa and Homer know the truth about Hans Sprungfeld, but the myth of Jebediah Springfield lives on. How cromulent. Fittingly, the Springfield Historical Society is the site of several very quiet jokes: There are the paintings of Otto, Marge, and Professor Frink’s colonial ancestors, as well as Horace’s voiecover for the “Springfield is founded” display, which is delivered live (with chicory-mug filter) and not via the speaker in the display case. Bart’s minimized role in “Lisa The Iconoclast” doesn’t really sink in until he drops by to take a dig at Lisa’s Sprungfeld/Washington dream. Just further proof of Lisa’s ability to carry an episode on her own. Next week: Gwen Ihnat’s duties for “Homer The Smithers” include answering Mr. Burns’ phone, preparing his tax return, moistening his eyeballs, assisting with his chewing and swallowing, lying to Congress, and some light typing.